Wednesday is Salad Day here at BCL! Salad Day is a very special salad potluck lunch where members can kick back and get to know each other a little better. We'll provide the greens and tunes, you bring the toppings and your dance moves (dancing not required). Every Wednesday 12:30 in the 3rd Floor lounge. Tuesday, 12/12, 5:30-7:30 @ Lavender Lake. Appetizers, open bar, and good fun. Join us on the First Floor, once a month, for Breakfast Monday! We'll put out bagels, fixin's, fruit and coffee- you bring your sparkling personality. It's a quick and easy way to meet a few people and ease into your week. Artist Reception: Molly Sullivan's "Waves & Shore"
Molly Sullivan is a Brooklyn-based visual artist specializing in drawing and mixed media. She finds inspiration in our complex relationships with the natural world. Waves & Shore is a tribute to the ocean: its vastness, rhythm, and inherent unpredictability. The ocean is a place of relentless change. Without warning, light becomes dark. Tranquility gives way to violence. It wears away at our carefully built structures; churns our refuse and throws it back at us. It hides unknowable worlds beneath an ever-changing surface. It shows us ourselves. 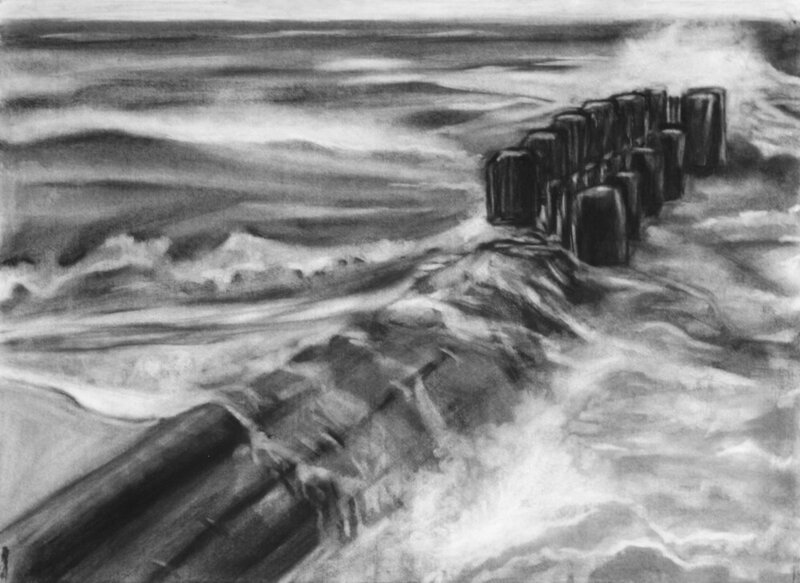 The charcoal drawings in Waves & Shore were inspired by the beaches of Brooklyn and Queens, NY, and Amelia Island, FL. Lunch & Learn: Water- What's in it, What's out? Monday, 10/16, BCL is hosting another fun, informative Lunch & Learn! Bring your lunch down to the first floor conference room at 12:30 that day for "Water: What's in it, what's out?" presented by Amie Scott. Join us on September 19th from 5:30 pm to 8pm in the 3rd-floor lounge for an art reception. Get a chance to see the work up close, mingle with members, and ask the artists, John Tebeau, all of your questions. Brooklyn-based artist John Tebeau began making artwork celebrating favorite drinking establishments of New York City, calling his series Great Good Places, which led to a book called Bars, Taverns, and Dives New Yorkers Love to be published by Rizzoli in March 2018. John draws the bars in a loose, cartoony style in ink then colorizes them in Photoshop. Some of those files were made into posters by hand in Brooklyn, silkscreen style, the way T-shirts are made. Others were printed via the digital giclée method, and all were done on heavyweight, acid-free, archival paper, all signed and numbered in limited editions. Prints and the original ink drawings are for sale, framed or not, on John's website: tebeau.com. We'll discuss over FREE PIZZA in the 3rd floor conference room. Seating is limited, so you must RSVP to attend. Join us Saturday, May 13th for our first ever Bike to Smorgasburg Meet-Up as part of our Spring Into Fitness Month! Just bring you and your bicycle to BCL at 11 AM, we'll take off at 11:30 for the 4.5 mile ride to East River State Park Park, where we can stuff our faces at Smorgasburg before heading back to BCL. You can ride straight home from Smorgasburg or come back with us to make a complete 9 mile ride. Celebrate BCL's Birthday! Happy Hour's on us at Mission Dolores! Cupcakes provided by Jenni. Calling all BCL Makers -- authors, illustrators, photographers, jewelry designers, food producers, knitters, etc., etc.! BCL is holding its 2nd Annual members-only Holiday Bazaar! This is an opportunity for us to see -- and purchase -- the incredible things being produced by BCL members. Come to the 3rd floor lounge on Dec. 1st to see a display of books, food, art, and more, made by your fellow BCL members. BCL Community Manager and photographer is proud to announce her next Photography Show coming to Steeplechase Coffee in Windsor Terrace, Brooklyn. She invites you all to come on down to celebrate Friday, November 18th from 7:30-10:30. There will be refreshments, live entertainment and good company! The Gender Equality Law Center invites you to join us on November 17th beginning at 6:00pm for a discussion group on balancing work and family obligations. We want to hear about your experiences as well as share the details of the newly passed New York Paid Family Leave Insurance Act (“PFLIA”). In April New York State passed the most comprehensive and generous paid family leave law in the country. PFLIA will provide virtually every worker in New York State with up to 12 weeks of paid leave to bond with a new child or to care for a seriously ill family member. We think you would be a valuable addition to this conversation and hope that you will attend our Paid Family Leave Discussion Group next week. And, its right here in the 1st floor conference room. The Young Center for Immigrant Children’s Rights trains prospective volunteers to serve as Child Advocates for unaccompanied immigrant children in federal custody and deportation proceedings. This Thursday at 6pm, they're hosting a webinar for people who are interested in learning more about volunteering. I'll be tuning in from the 3rd Floor conference room, and I might even get a bottle of wine. The more the merrier. If you can't make it Thursday they're hosting a repeat Friday at 1pm EST. "Sample the best in local eats and drink. Meet the chefs and foodies from top local restaurants. All while raising money to support the Park Slope Civic Council's student scholarships!" Fall is approaching and we here at BCL are ready to hit the ground running! Literally! Better start training because we're teaming up to run 13.1 miles with the Brooklyn Rock 'n' Roll Half Marathon, October 8th. The Rock 'n' Roll race series is crazy fun, features live music along the route and culminates in a party in Prospect Park. Register today! New Mexico is widely known as The Land of Enchantment. Her beauty is wild, mysterious, dark and magical. Hechicera (Sorceress, or Enchantress) is a collection of images from all over the state. The Bisit/De-Na-Zin Wilderness (desolate area of steeply eroded badlands, Navajo Territory- Northwest NM), Acoma Pueblo (Sky-City, the entire Pueblo sits on a 365 foot tall mesa in Central NM), the Bosque del Apache Wildlife Refuge (Wetlands near Socorro, NM, home to hundreds of migratory birds), and White Sands National Monument (the largest gypsum dune field in the world, testing site of the Atomic Bomb in 1945- Southern NM). Jennifer Walkowiak is a proud New Mexican photographer who currently resides in Windsor Terrace, Brooklyn. Her landscapes and cityscapes have been shown in coffee shop galleries in Manhattan and Brooklyn since 2013. She is often seen shooting live music, comedy shows and private parties and dabbles in portraiture. Beginning October 6th, 2016- Hechicera will be on display in the Third Floor Lounge. Join us for an Art Reception to celebrate! Refreshments, music and joy will be provided. You’ve never been to a conference like this before. On September 28th, meet, listen to and network with Brooklyn’s best builders, founders and entrepreneurs inside the still under construction City Point retail destination in Downtown Brooklyn. No hard hats required. Visit BCL member, Honey & Wax Booksellers , at one of the country's largest regional antiquarian book fairs. The third edition of BABF brings more than 100 quality antiquarian book and ephemera dealers from all over the country, Canada and Europe, to the new Brooklyn Expo Center, easily accessible from all parts of Brooklyn, Manhattan and beyond. I know some of you have been seeing the flyers around and it's true! Now, as a member with BCL, you can get a discount of $25 off the annual membership.Tomorrow we have a Citi Bike Ambassador coming to visit us for more information about our new promotion and a free tote bag when you sign up. Stop by the 3rd-floor lounge tomorrow from 12pm to 2pm and find out more.